Originally posted November 19, 2011. German music producer Frank Farian was the creator of Milli Vanilli, a dance-pop outfit from the late ‘80s. 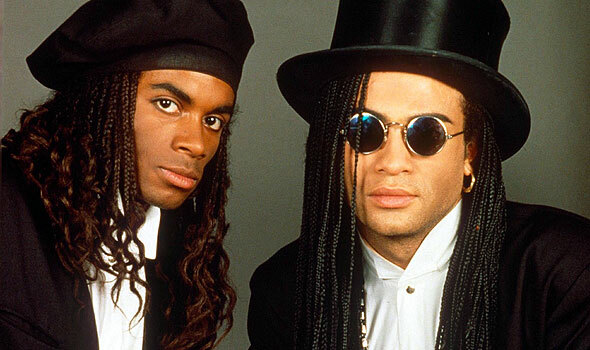 They were presented as the duo of Rob Pilatus and Fabrice Morvan and found success quickly. In October 1988, the single “Girl You Know It’s True” hit the UK, peaking at #3. It charted a couple months later in the U.S. and climbed all the way to the #2 spot. They proved to have ample songs to go the distance. The next three singles, “Baby Don’t Forget My Number”, “Girl, I’m Gonna Miss You”, and “Blame It on the Rain” were all #1 hits in the U.S. A fifth single, “All or Nothing”, went to #4. All five songs appeared on the 1989 U.S. album Girl You Know It’s True, a reworked version of the previously released German album All or Nothing. Not surprisingly, the U.S. album logged eight weeks atop the Billboard 200 and sold six-million copies. The duo’s commercial clout translated to Grammy clout as well when they took home the 1989 trophy for Best New Artist, beating out Tone Loc, Neneh Cherry, Soul II Soul, and the Indigo Girls. The only problem was that Rob and Fab didn’t sing. While the original German album only featured them on the cover, the U.S. version went a step further and actually credited the pair with the vocals. In actuality, the dancer-models were hired to serve as the public face for Brad Howell, Johnny Davis, and Charles Shaw – the session musicians who did the actual heavy lifting. Shaw publicly admitted the ruse which supported suspicions that Rob and Fab were lip-synching live performances. The duo pressured Farian to let them sing on the next album. Rather than cave, he confessed the deception to the press. Soon the Grammy cops came knocking and demanded the return of the ill-gotten award. It is the only time the Grammys have revoked an award.